What is The Grand River Adventure? 7 days 250 km 1 Grand River Welcome to the second annual edition of The Grand River Adventure! 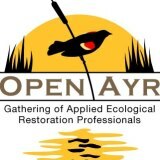 When: Thursday March 21, 2013 Where: 33 Northumberland St Ayr, ON N0B 1E0 Please help us celebrate the first day of spring by attending the second ‘Open Ayr Gathering’, an opportunity to engage in dialogue regarding the unique and specialized industry of ecological restoration. On October 20th, 2011 Quiet Nature hosted the first annual Open Ayr Gathering of Applied Ecological Restoration Professionals. The weather was not in our favour, so the event was ironically held indoors at the historic Richwood Schoolhouse, a 150 year old stone building 10 km south-west of Ayr.